These turkey sloppy joes are full of great flavors and are super easy to throw together after a long day! Plus, this recipe freezes well so make a big batch to enjoy another time too! Summertime makes me think of sloppy joes. I know they’re stereotypically a “kid food” that comes out of a can. However, I don’t really remember eating them until later in life. I always skipped over them in the lunch line in elementary school, so it wasn’t until I worked at a summer camp in college that I really ate them regularly. At camp, you eat what you get… or you eat PBJs. 🙂 And you’re hungry from being outdoors ALL day long, so you really DO want to eat, no matter what’s on the menu. Those were some of the best summers of my life and I wouldn’t trade them for anything. If you work at camp, you’ll understand I’m sure. Around this time, my mom started making homemade sloppy joes using this recipe from the Neely’s. While I love that recipe, it isn’t quite as good with ground turkey so I started trying other recipes online. And this is a recent one I tried that we LOVED! So of course, I had to share it. 🙂 It’s BBQ sauce based, meaning it tastes like a million bucks with minimal effort [read: no measuring a zillion spices]. Just give this a quick 20 minute simmer after cooking the turkey and veggies, and you are golden! It’s not too sweet, not too tangy… absolutely perfect. I’m not much of a “freezer cooking” kind of girl but I do like to make big batches of our favorite meals and freeze some of it for a future busy night. This recipe freezes great, and is a great one to double! I like to let it cool and pop half into a freezer bag for another time, but something else you could try is portioning it out into smaller tupperware containers that you could grab for a work lunch or single serving dinner. 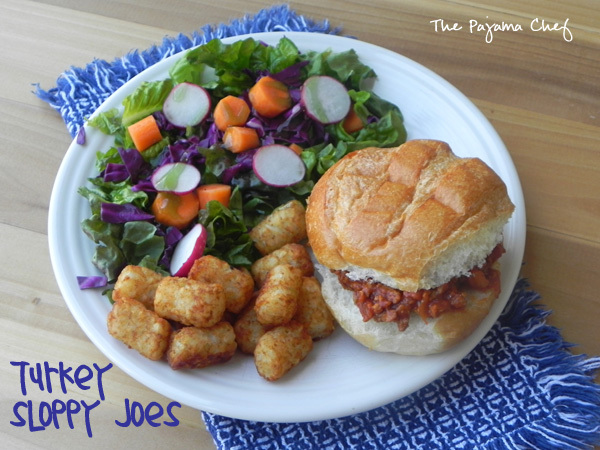 I think I’m too messy of an eater to eat sloppy joes in the middle of the work day, but I really like the idea now so I just might try it! 🙂 Enjoy! In a large skillet set over medium heat, heat olive oil. When it’s hot, add onion and peppers and cook until soft, about 5 minutes. Add the garlic at the end and cook an extra 30 seconds or so, until fragrant. Remove veggies from pan and place in a bowl. Then, add the turkey to the skillet and cook until no longer pink, breaking it up with a wooden spoon as you go. Drain any grease if necessary. Then add veggies back to the pan, along with the tomato sauce, BBQ sauce, Worcestershire sauce, chili powder, tomato paste, hot sauce, and brown sugar. Stir to combine. Reduce heat to medium-low, then simmer for 15-20 minutes. Taste and season with red pepper flakes and freshly ground black pepper as desired. Additional brown sugar or even ketchup can be used if the sauce is too tangy/tart. Serve on hamburger buns and enjoy! This recipe also freezes well! What a wonderful presentation of a tasty meal! Congratulations! I totally want to make these to bring to work 🙂 I haven’t had sloppy joes in way too long!! Love sloppy joe’s! I remember the first one I ever ate. 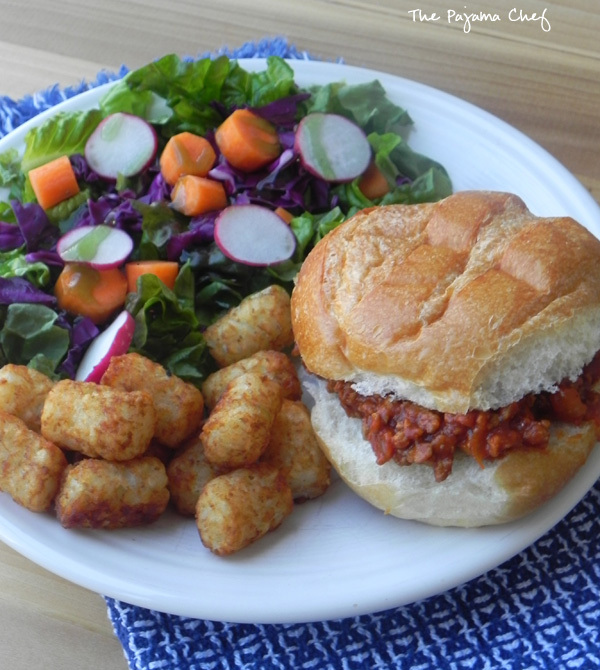 My mother gave us very whole/clean foods to eat so my first hot lunch at school was sloppy joe’s…didn’t agree with my tummy, which hadn’t been exposed to whatever was in those. LOL! I was sick to my stomach all day and finally threw up when I got home. But I’ve been lovin them ever since! These look great, love your pics! awww i’m glad you love sloppy joes even after that introductory experience!! 🙂 thanks girl! Thank you, Dani! Yes, tater tots in the US. Potato gems are a cute name though. 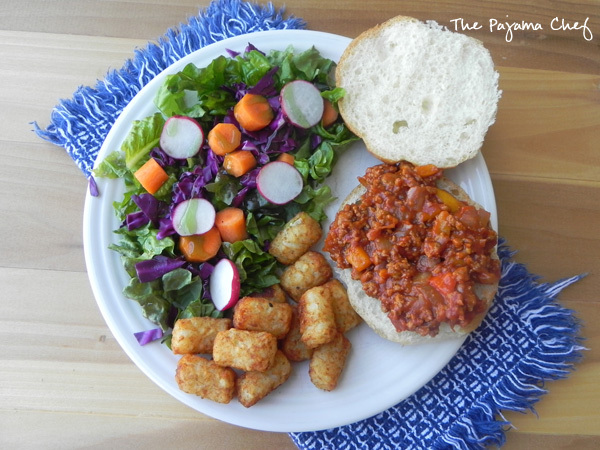 🙂 You should give these sloppy joes a try!